“I have no trouble selling someone else’s products or services, I just have trouble selling my own!” Joan despaired. A chorus of agreement rumbled through the class. I’ve met many women who work easily “on behalf of the children.” It makes them feel less selfish. Usually these same people they can promote and sell someone else’s products or services much better than their own. To promote their own feels too much like bragging. It’s the “good girl” syndrome: Don’t brag, don’t be forward, be nurturing, be giving, be nice. If this was your upbringing, you’re going to have to work to get over it. Or use it: It’s not bragging if your service can really help the other person—it’s your duty to them to convince them to buy the service that will make their life better. It’s perfectly okay if you benefit, too, and make a profit! If you don’t make a profit, you’ll be out of business, and then you can’t help anyone any more. See how this works? It’s called “re-framing” in psychology circles. Give yourself good, positive reasons to be successful, and help people at the same time. You don’t have to choose. You can do both. 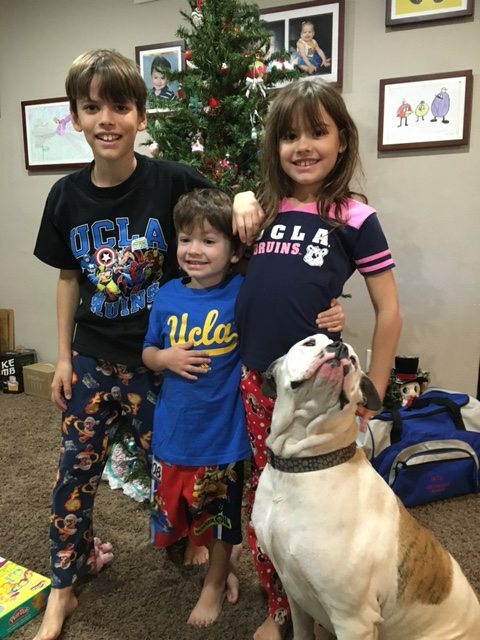 My Grand Nephews and Niece sporting their Christmas UCLA gifts! Neither woman called the next morning. In fact, they never called. What’s up with that?? Aren’t they networking to get more clients for their business? And here was a client with money who wanted to buy – why wouldn’t they call her? Sarah’s experience wasn’t the only one. Throughout my networking career, I heard stories like these over and over again. Once I called a woman who had been a regular at a networking meeting and stopped coming. When I called and asked her why, she said the group didn’t work for her – she never got any business from it. “How many meetings did you go to?” I asked. “Did you call people after the meeting?” I inquired. I knew she wouldn’t be in business for long. Let me give you a tip: They aren’t going to call you. So most small business owners continue to network and not get the results they want, and make a lot less money than they deserve. If you have any struggles around money these days, obviously, you are not alone. The whole world has been affected by the financial debacle of the real estate bubble. The financial hardships I see are even harder on women, who still only make 77 cents to a man’s dollar, largely because women still feel badly about “asking for money”. But in the marketplace, we must ask to be paid for our services! Women have a lot of negative emotional baggage around that request, and so often, women don’t ask for what they are worth and settle for less than they should expect. Did you know that men are 8 times more likely to negotiate their starting salary than a woman? And if she settles for $25,000 per year and he negotiates $30,000, over the next 30 years (with the same percentage raises, bonuses, etc.) he will have made over $500,000 more than she! I understand it – I think it’s partly biological – a woman needs to be able to put others first in order to raise children. This giving quality makes us great care-givers, nurturers, teachers, and workers in the helping professions. And so we naturally think of others and the stress they might have in paying us. So we make allowances, reduce our rate, and even give it away for free. We wait for people to call us because we don’t want to “bother” them. Even when they ask us to call them! We have to change our thinking and our behavior with money. Because the real money we lose is the money we fail to earn. Want more tools to help you transform your business and your money? I wrote my new book “From Worry to Wealthy: A Woman’s Guide to Financial Success Without the Stress” especially to help you feel empowered to win at everything you do! Make more money and have more time off for fun with this engaging guide to mastering success.